Winters are long here in Saskatchewan. Long, cold and full of ice and snow. While city and highway crews are out sanding and salting our roads to keep us safe it’s up to home and business owners to keep their families and customers safe on their sidewalks and steps. There are various options out there for consumers to deal with their icy walkways. Some are effective, some not so much and most have some serious drawbacks. Salt, other ice melting agents and even ice scrapers can be destructive. Several years a go my husband and I tore out our old sidewalk and put in paving stone. It looks fabulous and we want it to stay that way. We aren’t too keen on throwing corrosive salt or ice melt on our walk to manage ice. They eat away at the paving stone and, since most ice melts are colored, they also leave nasty stains. We also have a lush lawn that we have worked very hard at growing and a beautiful perennial flower bed. The last thing I want is for salt and other chemicals to be running off into the rest of my yard. Not only is it harmful to our lawn and plants but we have a toddler who spends a lot of time playing in the yard. I don’t want her exposed to that sort of thing either. Luckily there is another option! I was recently given the opportunity to test and review EcoTraction. What is EcoTraction? While I don’t currently have any pets (well except for Sparkle the fish but he doesn’t get out much) I do have a young daughter and using a safe product is very important to me. It is also important to the developer of EcoTraction, Mark Watson. After licking road salt, Mark’s dog sadly became ill and passed away. It was that tragedy that prompted him to seek a better alternative to the harmful products that were on the market. If you are a fan of CBC’s the Dragons Den, which I am, you just might recall the EcoTraction pitch. The Dragons were so impressed that all five of them signed up to work with EcoTraction. As luck would have it (I think) we were just blessed with a pretty generous snow fall, followed by the fluctuating temperatures that create some pretty hazardous ice so I was able to put EcoTraction to the test right away. EcoTraction is simple to use. 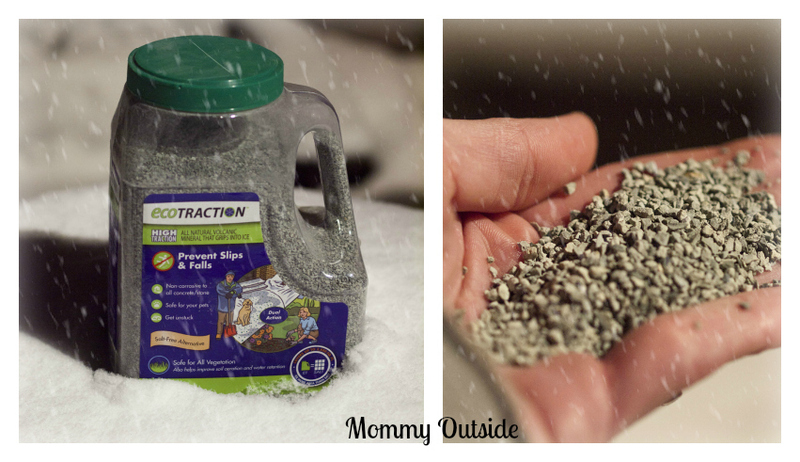 Simply sprinkle it on any ice (or snow) and you have instant traction. That’s right – instant! No waiting for some nasty chemicals to react, no waiting for the ice to melt. The granules immediately grip to the ice providing amazing gription – ok if you live in Saskatchewan that is a real word!! 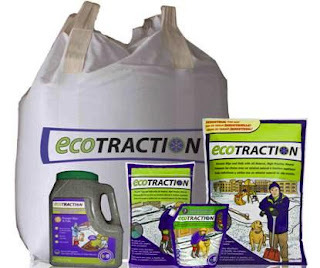 Besides the awesome traction that EcoTraction provides, another huge benefit that it has over other products is that when the snow and ice melt you can simply sweep the granules onto your lawn and garden. Not only will it not harm them, the naturally occurring volcanic material is even beneficial! I used EcoTraction to tackle the huge patch of ice that inevitably forms on the walkway on the side of the house whenever is snows. We generally avoid using that walkway most of the winter because it is such a hazard. A few shakes of EcoTraction and we had a useable walk again! No ugly blue chemicals, no worry about salt eating away our walk. And a little bit of this stuff goes a long way. EcoTraction is ultra-concentrated. Each bag covers up to 9 times the area of other products on the market. If all this isn’t enough to make you want to give EcoTraction a try this winter how about this – EcoTraction just received a PTPA Award! What does that mean? 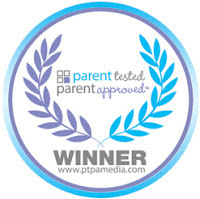 It means that EcoTraction has been Parent Tested and Parent Approved! EcoTraction is available at retailers across Canada including – Canadian Tire, Home Depot, Shoppers Drug Mart, Home Hardware and more. You can find a local retailer here. Want to learn more? Connect with EcoTraction on Facebook and follow them on Twitter. You can also check out some more of their videos on YouTube. To enter simply complete the Rafflecopter form below. Want some more chances to win? Head on over to Powered By Mom for another chance and tomorrow you can visit Older Mommy Still Yummy and the Knit Wit by Shair for even more chances to win! Disclosure: Mommy Outside was provided with product to facilitate this review. All opinions are 100% our own.